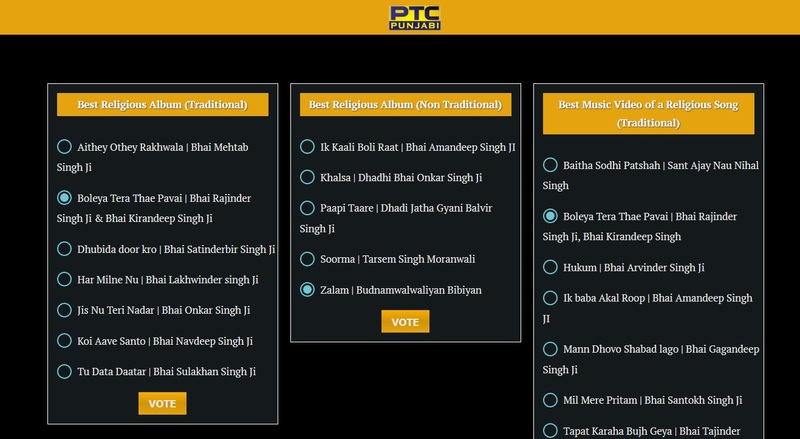 The awards are presented annually by the PTC Network to honour the top Punjabi music stars. This time, PTC awards are scheduled to be held in Mohali on 8 December, 2018. 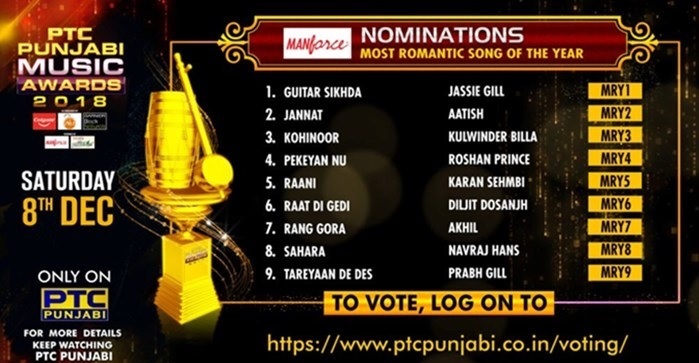 These Voting Terms and Conditions cover the Voting Phase of PTC Punjabi Music Awards 2018 and by reference are incorporated into the Official Rules. The event will be aired live on PTC Punjabi. Besides, the mega event will also be shown live on PTC Punjabi Gold YouTube channel. Well-known Punjabi singers like Bohemia are expected to perform live during the PTC Music Awards 2018. Voting in Final Voting Period of the MUSIC AWARDS is open to individuals who are at least eighteen (18) years of age at the time of voting .Voting is void where prohibited or restricted by law. Each voter may vote for one contestant. 2. Voting times may be subject to change. 3. PMA reserves the right to cancel or suspend voting at any time. 4. The eligibility of any vote is at the sole discretion of PMA. 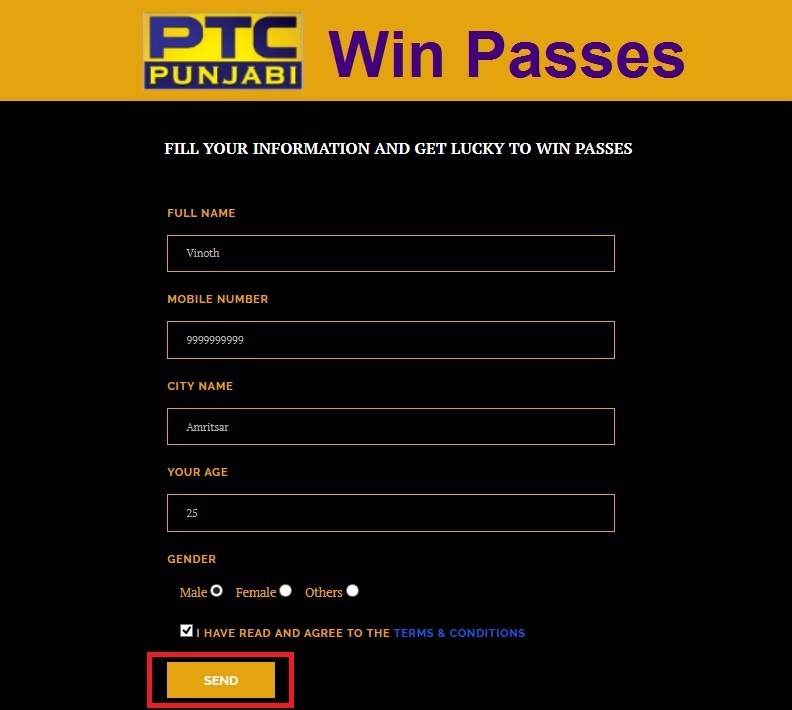 Step-2 : Fill your information in the form and get lucky to win passes. 1. PMA reserve the rights to disqualify votes if has reasonable grounds to suspect that fraudulent voting has occurred or if it considers there has been any attempt to rig the voting. 2. PMA’s decision in relation to all matters affecting the Vote is final. 3. Mobile Number collected will be used to send promotional SMS from third party and for internal product promotion. 4. PMA reserves the right to amend these Terms and Conditions without prior notice. 5. Any changes will be posted on this website and such posting shall be adequate notice to all participants. 6. These Terms and Conditions shall be governed by Indian Law.